The official start will might be still a few weeks away but it’s already getting cooler around Chattanooga. You may be tempted to light your first fire of the season in the fireplace. Before that happens, it’s always a good idea review some important fireplace safety tips. This is information that should be shared with anyone going to be lighting a fire in your home. Anytime you start a fire, you’re going to release a certain amount of soot or creosote. 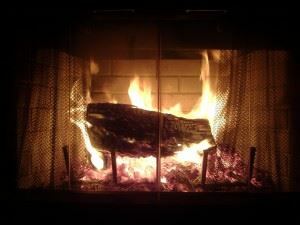 You can minimize the amount that is the lease by using season hardwood or manufactured fireplace logs. These burn a lot cleaner than real word and provide you with the same amount of warmth. Just remember that a manufactured log burns a lot hotter than a regular wood log. That means you should only burn one at a time. As tempting as it might be to use the fireplace as a disposal you should never burn anything other than wood for manufactured logs. That includes things like wrapping paper or other packing material. Around Christmas time, you definitely don’t want to burn any greenery such as holly. Although a roaring fire might look attractive it’s not as safe as a control birth. A fire that is too hot can actually crack your chimney. This can result in some expensive repair that you probably weren’t anticipating. When you are preparing your fire, you want to stack your logs as far as back in the fireplace as possible. This will ensure that sparks and embers won’t fly out your carpet. Also, make sure that the damper is open before you light the fire. It also helps to open a window just to crack bring in more oxygen for the fire to burn more efficiently. Obviously if you are starting a fire, it is there for you to enjoy. Yes, you can walk in the other rooms and come back but you should never go to sleep with a fire blazing in the fireplace. At the end of the night, make sure it is completely extinguished. A fireplace is a central feature of any room but it doesn’t mean everything needs to be close to the fire. You don’t want to position any furniture near the fire. That also holds true for any clutter like stacks of newspaper or magazines. Getting rid of clutter like old papers or junk mail is easy. It’s the bigger items that cause a challenge. Junk King Chattanooga is up to the challenge of removing all kinds of unwanted furniture, appliances and other clutter from your home. Their crews will do all the lifting and loading for you so your back will never be put at risk. A safe home is a clutter free home. Junk King Chattanooga can help make that happen today. This entry was posted in Chattanooga Junk Removal and tagged clutter, fireplace, rubbish, safety on August 31, 2017 by Junk King. Last updated August 31, 2017 .